Back in December, we got a tip depicting a new Android update roadmap for Samsung devices that moved the Note 5 from the previously rumored Q4 2015 update queue for Marshmallow, to Q1 2016. Our source mentioned at the time that the Galaxy S6 and Note 5 had their Android 6.0 Marshmallow software in testing, and the official rollout was scheduled to begin this quarter. Fast forward to today, and Samsung has indeed announced that it started seeding Android Marshmallow to the unlocked S6 gang worldwide, with carrier models to follow. 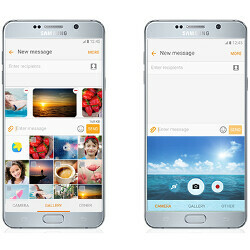 Now, Samsung has posted more details about new features that the update will bring. Apart from the standard fare that comes with Android 6.0, like the power-saving Doze mode, the granular permission grants, or adjusting the video sound speeds, Samsung has updated the looks of its interface, too. The notification bar area, which is arguably the biggest eyesore of TouchWiz, that has now received a white theme, and the beta testers report how the whole interface, as well as the keyboard, have become faster and more responsive. That's not all there is to it, though, and the update seems to have been worth the wait, as the company announced it is now providing a brand new Samsung Internet 4.0 browser, and a very helpful Cross App multi-window mode for your chat sessions. Check out the juicy details below, and dream of those delicious s'mores. The overhauled Samung browser sport plenty of under-the-hood improvements like full compatibility with the latest web standards, and zippier rendering. It also employs the Service Worker API, for when your connectivity is slow, and has back-end access to the OS for background syncing and push notifications. The secure Web Auto Login option has been updated, so that when users log in to a web site, their identity is protected with fingerprint reading, thus only those authorized will be able to read the browser data. Any additional biometric technologies will be added to Secure Web Auto Login further down the road, too. There's a new Secret mode that doesn't record browsing history, cookies, passwords, auto-fill data and the like. This sounds like the Incognito mode in Chromer, but there is more - the Secret mode is accessible with a fingerprint reading, "ensuring only the proper user is able to look at sensitive data, even when in protected mode." You can still bookmark sites and save pages, but they will be in a protected space, accessible only with your fingerprint, not bad at all. The other notable debut with Android 6.0 on Samsung devices is the so-called Cross App, which is a very interesting take on the multi-window mode concept that comes with Marshmallow. Samsung has provided Cross for messaging apps, splitting the screen in two when you need to choose, send or shoot a picture or video, opening the respective service in the lower half of the screen, so you never have to exit the chat app to do these actions. Cross App lets you open a full-fledged browser there, previewing a link directly in the window, taking it up full screen to read, then sliding it back down in the lower half of the display. Last but not least, Cross App will now allow to play videos directly in the chat app you are using, or open them in full screen without ever leaving the session. Sound like an awesome addition to our endless chat threads, so we can't wait to put our hands on the update for a spin. 2 years? Even the S3 has dual window. This is an update to the split-screen multitasking functions. Samsung galaxy S3 users can claim to be the first to get that feature! and that's about 3 years ago! yea whatever :P ... lost count! That's funny. He doesn't know that LG copied all their features from Samsung. No. Its a TouchWiz thing. Ooh is that the s7 edge the third device? See it has a smaller screen than the Note5. Am i right? interesting..... hope someone backports this browser for older droids. Samsung will release Browser V4 to almost all of their Lolipop devices in next 2-3 months . They wrote this in Google Play Store , in app description . Finally they to fix the keyboard lag on the phone. Hope Google add similar features to stock android. Yet another example of awesome features you get with TouchWiz. All this impatient crying about getting it right after stock android (which google used a whole year to make and test) is released are just unrealistic and delusional...Unless google get's it's act together and makes a stable build of Android available to OEMs 2 or more months before it's publicly available, there will always be a delay when it comes to significantly feature-packed skins like touchwiz. Looks like a fairly useful concept. I've been using the ability to slide photos and videos from the gallery into a message using splitscreen and into email as well and that works great, so this is a nice improvement. Glad too its not a rumor, but a direct confirmation from the manufacturer.